Whether your hunting for Rio Grande Turkey, Axis, Blackbuck, Scimitar-horned Oryx, Whitetail, Fallow or Red Stag, we provide an outstanding hunting experience to all our guests. Together, our facilities, abundant game, attentive staff, flexible programs and fair pricing will give you the great experience you’re looking for. Hunting is available year round. Click here to find out more about when you can hunt. Click here to find out more about how we hunt. Three different hunting plans are offered; one is sure to meet your needs. We offer day hunts, ranch-based hunts and special hunting packages. A day hunt provides you with one day of guided hunting for the animal(s) of your choice. Normally we begin the hunt before daybreak and hunt until mid-to-late morning. We then take a break for lunch and return to hunting in mid-afternoon. This second hunt can continue until it's too dark to hunt. When you choose a day hunt you pay a daily hunting fee that provides for your use of ranch facilities and a one-on-one guide. (An option for semi-guided hunting, primarily for bow hunters, is also available.) You then pay only for the animals you actually harvest. We guarantee that you will get an opportunity for a shot at the animal you're looking for. If you don't get that opportunity you can return for one additional day of hunting with no daily hunting fee. 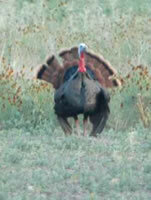 If you choose to hunt for multiple days you would stay at a hotel or motel in nearby Kerrville or Fredericksburg. You will be responsible to provide your own meals and beverages. Ranch based hunts are the ultimate hunting experience at Buck Valley Ranch. Use of all ranch facilities, lodging and guide services are all included. Bring your own food and use the cooking facilities at the ranch, take advantage of nearby restaurants of every description or choose our Meal and Beverage Plan. You pay only for the animals you harvest. Special hunting packages can come in a variety of forms. Typically they combine either a day hunt or a ranch-based hunt with specific animals. These packages may offer a discount on the prices of individual components. Normally, two hunts are done each day, one beginning before sunrise and ending mid-morning and the second beginning in mid-afternoon and ending at dark. Working together with our team of experienced guides your group will fan out among our eleven custom built hunting stands, three elevated bow stands, four tree stands and three permanent ground blinds to be in position to harvest the game you’re after. Your guide will discuss animal and shot selection with you to make sure your expectations and animal agree. After the kill your guide will clean, cape and quarter your animal. You may store your animals in our walk-in cooler until your departure or our delivery to a meat processor and taxidermist. We believe you should pay for only what you receive. Your hunt fee provides you with the use of facilities and should put you in a position to get a good shot at the animal you’re seeking. When you harvest an animal the animal fee pays for the animal based on its value as a trophy. We believe that hunting at Buck Valley Ranch provides both a great hunting experience and a great value. For some thoughts on comparing hunting at Buck Valley with having a hunting lease please read our article on Hunting Lease or Commercial Hunting. Please also check out the additional pages that describe our hunting stands, our animals, the way we classify animals and our rules and practices.